Join Paul Hopper and Billy on just another outstanding trip to the laid-back ambiance and outstanding diving found on the island of Cozumel in the Mexican Caribbean. You’ll enjoy a week at the beautiful beachfront Hotel Sabor, with 5 days of diving with our friends at Dive House. It don’t get any better. 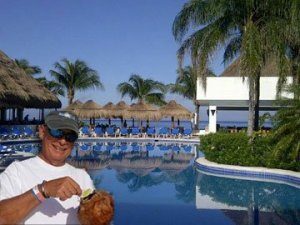 Paul has 30 or more trips to Cozumel under his belt, so you’ll be in the experienced hands of a great trip leader. Private check-in for the group. Welcome drink and cool towel upon arrival for the group. Trip price does NOT include airfare or departure tax. Trip price is based on double occupancy. Please be advised that if you’re traveling by yourself, you may be charged the single occupancy rate if we cannot find a suitable room-mate for you. Talk to us if this is a concern. Single occupancy surcharge is $400. Trip price is subject to change without notice, but full payment guarantees the price. $300 non-refundable deposit holds your spot. Final money due July 26, 2019.